The funeral of Russian oligarch Boris Berezovsky, found dead at his house near London, took place on May 8 at Brookwood Cemetery in Surrey. However, his will – drawn up just nine days before his death – has left more questions than answers. The funeral of Russian oligarch Boris Berezovsky was always going to be a private affair, held behind closed doors to the media. Very few of his friends attended. 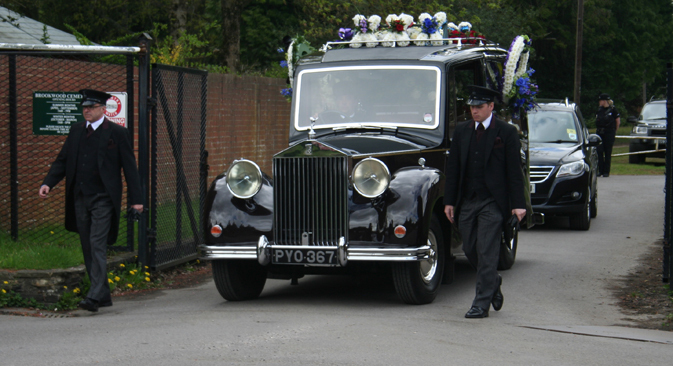 Surrey Police confirmed to Voice of Russia that the would be attending a funeral at Brookwood – near Guildford – to prevent any hindrance to the proceedings, although they refused to say if it was for Berezovsky. However, they denied reports that amed police were in the area. Thames Valley Police, which is leading the investigation into his death, would not confirm funeral arrangements, saying it was a private affair. The few mourners included Akhmed Zakayev, Boris's friend, and members of his legal team. there were fewer than 30 people at the cemetery in Surrey, according to journalist Luke Harding, of the Guardian, in a tweet. He also reported a Ukrainian TV crew hiding in bushes. The self-made billionaire – said to be worth $3 billion – was a former academic who built his fortune with investments in oil, cars, aluminum, and the media. He played an integral part in Vladimir Putin’s rise to power in 2000. However, they fell out when Putin began charging many oligarchs with tax evasion. Berezovsky fled to England in 2000, where he lived until his death. However, it was reported in The Times that although he had recently changed his will, his executors had refused to carry it out and a court had appointed an accountancy firm to deal with his finances, said to be in some disarray. He was found dead in his bathroom at his mansion in Mill Lane, Ascot, west of London on Saturday March 23. But friends say he was not suicidal and believe he was strangled. Reports circulated that he was due to be cremated at Gunnersbury Cemetery on May 6. However – being a municipal cemetery– that seemed unlikely as it was a bank holiday in the UK.